The Buccaneer was a pretty remarkable aircraft when it first arrived in the late 1950s. Supersonic, extremely fast at low level, long ranged, carrier based, nuclear capable. It served the Royal Navy capably, operating off the big (by British standards) ships like Victorious and Ark Royal alongside Sea Vixens and Phantoms. When the fleet carriers were retired and the TSR.2 bomber for the RAF was cancelled around the same time, the RAF took over the Buccaneers in the land-based strike role. They served in this capacity right up to the end of the Cold War. Famously, they had their last hurrah during the Gulf War in 91, when Buccs equipped with laser pods flew alongside the Tornados that supposedly replaced them in RAF service. 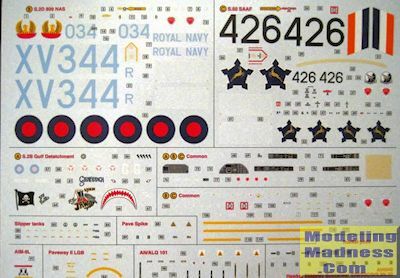 This kit offers the decals for that version, along with a Royal Navy jet from the carrier days. 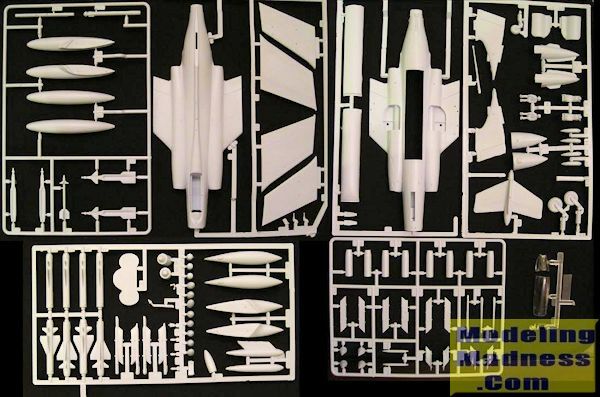 South Africa used the Buccaneer as well, and this kit includes decals for that. So this is a fairly recent re-pop of Airfix's venerable Buccaneer kit. It's been in the Airfix catalogue for the last three or four years. What it comes with that's new is two extra sprues. One is for the Gulf War version, and on that you get two LGBs, a laser guiding pod (Pave Spike), an ECM pod (AN/ALG-101), one Sidewinder, and a pair of revised slipper tanks. The other is for the Navy version and has some nicer rocket pods (compared to the originals) and their pylons. Otherwise it's the old kit, which is ok for its era. It certainly has two nice pilot figures but everything else has pretty soft detail. The new decal sheet has markings for the instrument panels. You still get the old weapons too, in the form of four Martel guided missiles, with optional seeker heads. Unfortunately the laser guided bombs have really thick fins, way overscale and not nearly as nice as the fins on other bombs you'll find in kits of an older vintage. If you were to use those bombs, you'd definitely want to cut the fins off and replace them with some card or something. Decals are better than Old Airfix, better than Recent Airfix, but not quite as crisp as Current Airfix. As noted there are three options. The Gulf War barley coloured plane has a shark mouth and some subtle nose art. The Royal Navy version is from No 809 Squadron from its carrier days, in overall dark grey. The South African version is similar, but with a bluer-grey underside. Unless you go for the CMR resin Buccaneer kits, this one is probably the best bet. For starters it's not as expensive and more readily available, but it is also better than the Matchbox one from ages ago which Revell recently re-popped. That kit is actually of the Buccaneer prototype, the NAS39 (or so I understand). This Airfix kit is renowned for its troublesome fit and also the apparently incorrect shape of its nose. I've started mine, though, and I have to honestly say it isn't as bad in terms of fit as I'd been led to believe by reading people's online rants (isn't that so often the case?) As for the nose shape, I can see the problem too when I compare it against photos, but when it is sitting on the shelf-top flight line, it's actually not such an eyesore. Recommended if you want a Buccaneer. If the accuracy issues are very important to you, scratch a new nose or buy the resin alternative - either option will require some modeling skills.